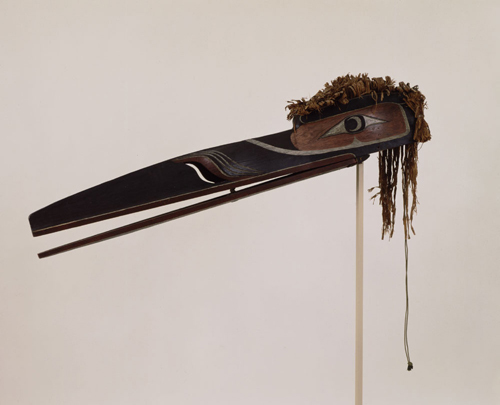 This mask represents Raven, one of the creatures most important to the Kwakwaka'wakw people. Known to be quick learners, aggressive defenders of territory, and very social with one another, ravens have been a respected clan emblem for centuries. Raven masks are worn during a portion of the hamatsa, an initiation masquerade for young men. Following a choreographed sequence, with beaks projecting upward and masks moving wildly from side to side, the hinged lower jaw of the mask is manipulated with a cord. When the cord is pulled, the mask responds with a loud clacking sound - the "hap, hap" of the birds' voices - adding to the dramatic effect of the performance. Hamatsa is performed at Kwakwaka'wakw potlatches. Potlatches are traditional cross-clan celebrations including dancing, feasting and magnanimous distribution of gifts held to honor births, marriages, deaths and other changes in social relationships. Potlatches continue to this day, despite attempts to ban them by both the Canadian and United States governments in the late 19th century.